As quoted from Wikipedia, the formal definition of Neuro Linguistic Programming (NLP) is: The study of the structure of subjective experience. NLP was developed in the early 1970's by Richard Bandler, Ph.D., an information scientist, and John Grinder, Ph.D., a linguist. EFT is a fast and easy process that can help anyone to remove the negative patterns and emotions that have caused problems in their lives. EFT has been described as one of the most important breakthroughs in the area of psychology ever. During the past 20 years EFT has been used with a broad range of difficulties, by thousands of practitioners around the world. To really understand EFT, you might have to open your mind to a new paradigm. EFT is an Energy Psychology or Meridian Therapy. It is based upon Traditional Chinese Medicine and Acupuncture, but instead of using needles to stimulate points on the body, we tap them gently with our fingers. The effectiveness of EFT only makes sense if you relate it to the human energy system. Einstein said ‘we are all matter’. Matter is energy. That’s just physics. Humans run an intricate energy system which is fuelled by electrical impulses that run throughout the body. When this energy system is out of balance, we experience stuck negative emotions, including stress, depression, anxiety, phobias, repeated unwanted behaviours, shame, guilt, and fears of all kinds. We may also experience physical symptoms, pain and other dis-eases. Some experts say that up to 80% of the diseases we experience are caused by stress. All emotions are natural and good, but they do need to process. Holding them stuck is what causes problems. EFT releases the stuck energy. Throughout our history, humans have been aware of the passage of time. Even Aristotle mentions the "stream of time" in his writings. Everyone is capable of imagining their own "Time Line", a line of time where we store all of our memories. This linear representation is how we unconsciously know the difference between a memory from the past and an imagining of the future, or an experience of now. Time Line Therapy™(TLT) uses this linear representation of time as the basis for a process which clears away negative emotions, limiting beliefs and un-useful decisions made in the past. 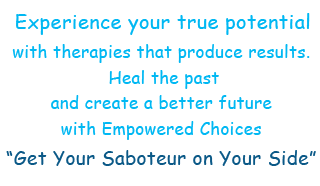 Time Line Therapy™ traces memories back to their roots and clears away the negative emotional charge, along with any limiting decisions that have been built around the resulting negative belief.